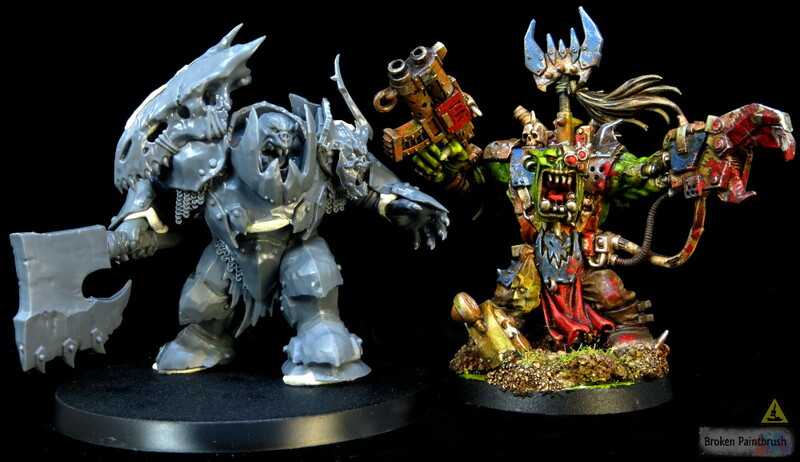 I am probably not alone in wanting the new Orruks when the leaks spread a month back. I mean, they are huge, they look mean as nails, and (to me at least) are the coolest kits released for Age of Sigmar. With that said, I pre-ordered only the Orruk Megaboss (for now!) with the goal of turning him into my 40k Ork Warboss. But as I’m starting to play with video posts, I figured an unboxing video was needed for this beast of a kit. I took the advice from my first video and made this one shorter and improved the audio. 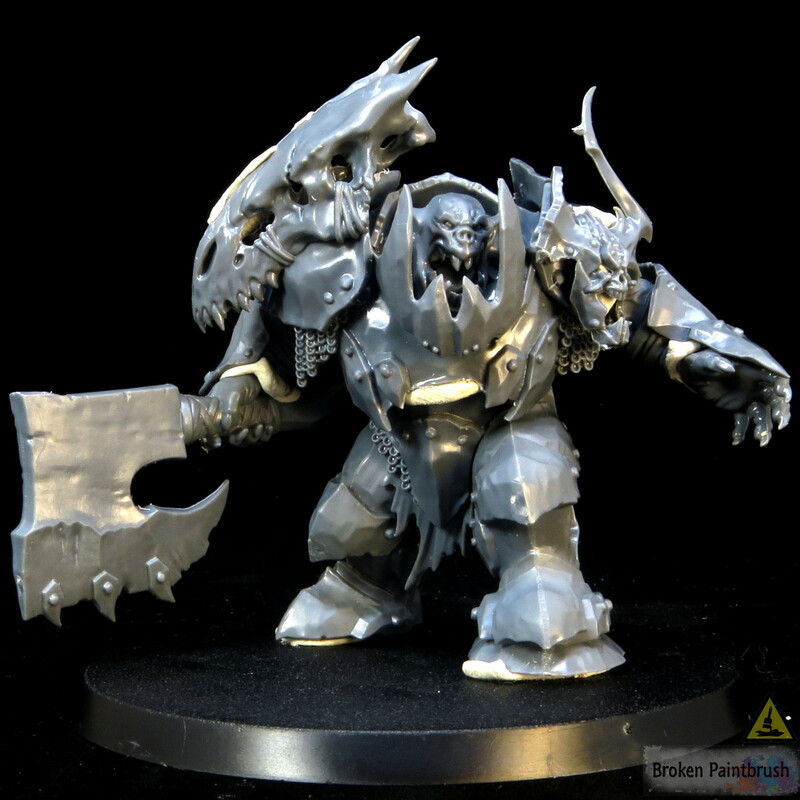 The Orruk Megaboss is a Beast! So the big thing to note on this guy is that he is huge! He fills in a 60mm base and wears it well. Height wise, he is a head taller than the Assault on Black Reach Warboss and easily twice as thick. As I’ll mention in the assembly section, he’s able to achieve this bulk by being hollow. This allows the model to bulk out without being a ton of dead plastic fill. For those ‘True Scale’ fans out there, you’ll be happy to note that this isn’t just a scaled up boy. In fact, his face is a bit smaller than the AoBR Warboss and the hands are about the same size. So in many ways, he becomes better proportioned. 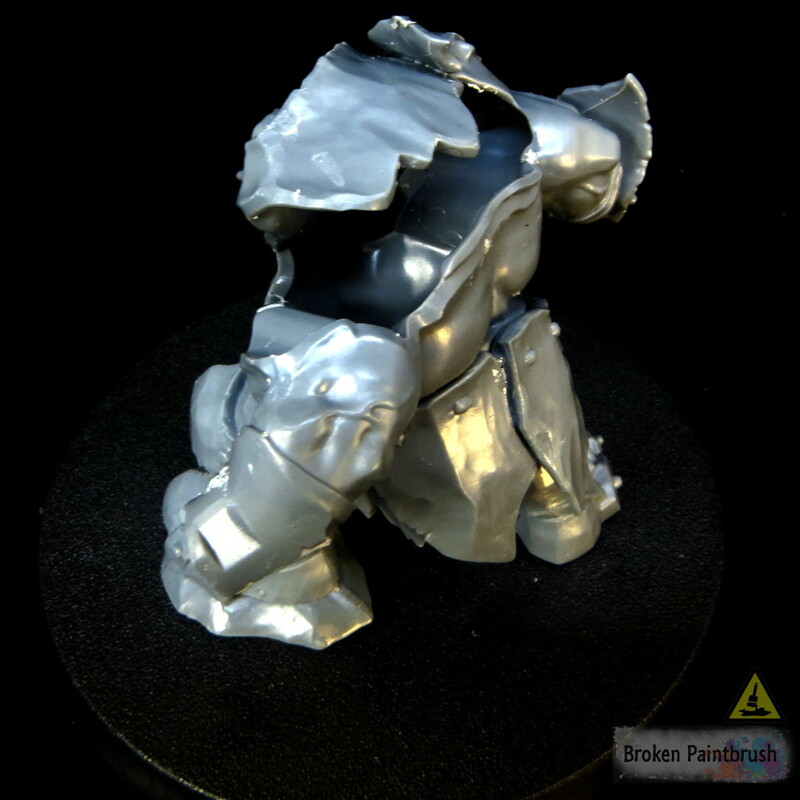 While the Orruk Megaboss is first and foremost a giant ork (Orruk) in beaten iron armor, he still has a right amount of details to make him interesting without being busy. First off is the pose. This is probably the only ork that I can think of that has an empty hand, but it works well with the extra large ax behind him. The empty hand, the forward step, and the slight twist really make him look like he is hunting his next battle. Some of the other neat details include the chain mail sections hanging between iron plates, the armor looks to be rough beaten (not smooth, fancy armor), and the edges mirror those of a wyvern claw. So this is where the fiddly bits come in. Remember how I said the reason he can get so bulky is that the designers took advantage of making him hollow. Between this and the digital sculpting that the GW team has been doing, makes for some fascinating pieces. It does help that the new instructions are including colored areas for where the pieces should meet. Still, this only gets you so far (as you see in the middle section of the video). I tried to hold the model together with sticky putty so that I could get a feel of him before adding glue, but all those fiddly bits kept falling apart or not making sense. Big note: don’t glue the face in until you are ready to paint! This model is fantastic in the sense there are multiple layers of armor, face, and open mouth. But that makes for a difficult time to paint. Unfortunately the upper areas of armor can’t be applied later with the awkward connection points and separation lines right in the middle of the skull and shoulder pad. I picked up the Orruk Megaboss as a conversion base for my 40k orks. 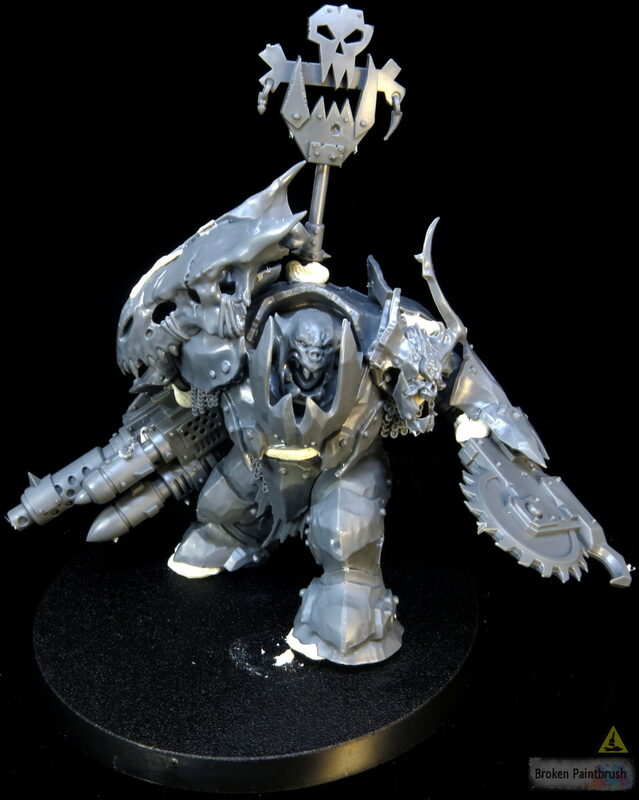 After looking over the model and partially assembling him, I think there is plenty of conversion opportunity for both 40k and AoS Orks and Orruks alike. The easiest one is that the hands are completely separate at the wrist. Meaning that any other Ork or Orruk hand could be added in relatively quickly. The problem will be coming back to the scale of this beast. 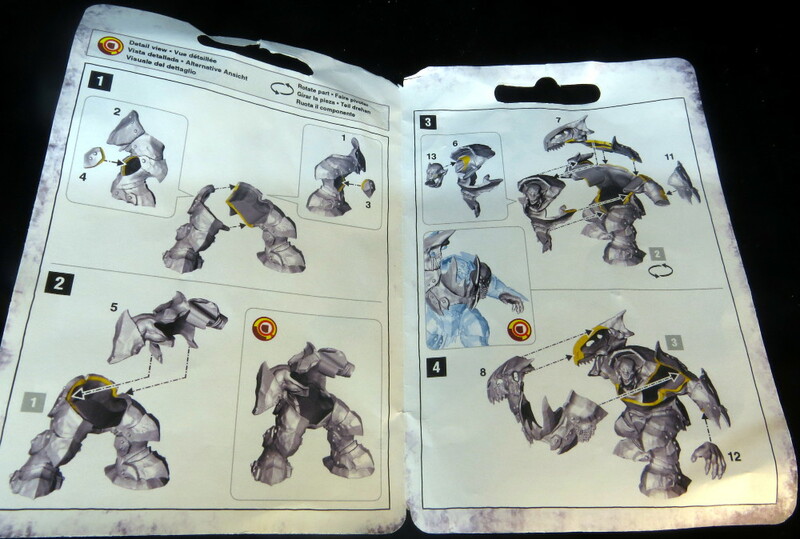 I’m not sure how the Brutes stack up, but the Nobz hands would be a bit small, though maybe not noticeable once built. The head could be swapped out with a bit more work. The neck would have to be gouged away to allow the standard divot-neck heads to be added instead. Doable, but does kill the awesome open mouth scream. The shoulder pad decorations could also be removed. The daemon skull is a separate piece which makes it easy to choose not to add. The dragon skull would take a bit more work but it only overlaps the shoulder pad, meaning that you could cut it off and rework into the beaten iron like the other pad. For changing the pose, I think only the very courageous and gifted sculptors would take on such a feat. There are so many overlapping armor plates and details that I wouldn’t want to change his pose. 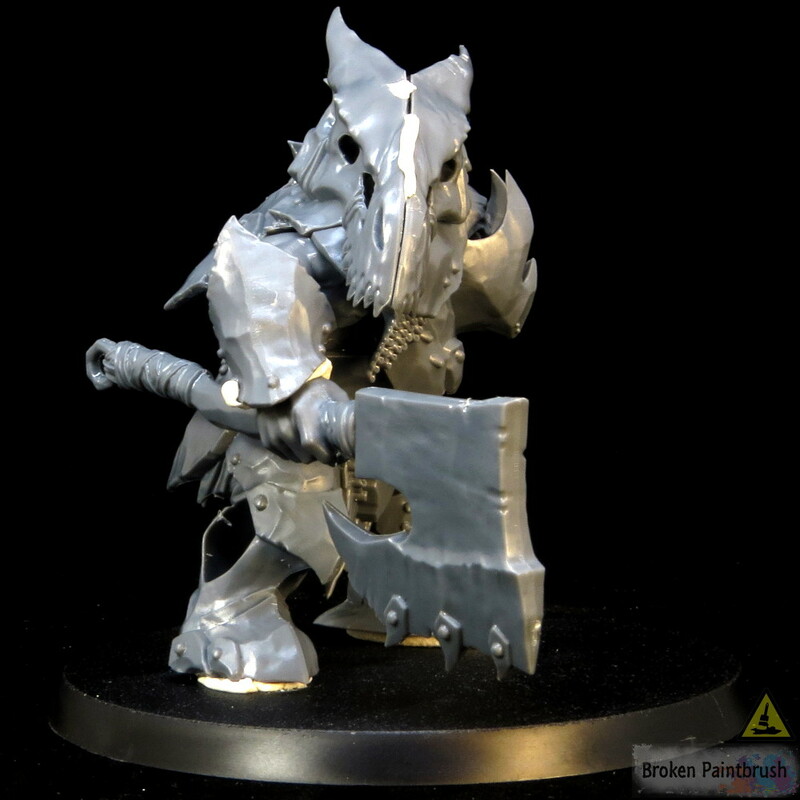 What are your thoughts on the new Orruks, especially this new Orruk Megaboss? Do you have any plans for him (40k or AoS)? Hit up the comments below for your thoughts on him or my latest video.